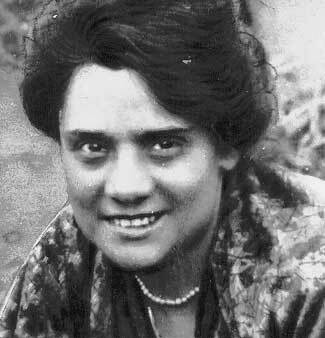 A short biography of Italian anarchist, anti-fascist, teacher and poet Virgilia d'Andrea. Virgilia d’Andrea was born on the 11th of February, 1890 in Sulmona- Abruzzi (Italy). At an early age she became an orphan and was taken to a Catholic college when she was six years old. She was to stay there until she got her teacher’s degree. This period of her life may be of some interest to those who would like to know something of her psychological make-up. As far as I am concerned, without having many details of her life spent in the college, I can assume that in such an arid, superstitious atmosphere, lacking freedom and affection, her vivid intelligence could not be placated. Instead of adapting herself to the environment, she had been nurturing a rebellious spirit against the institution of a social order which condemned her and many others to grow up in such inhuman conditions. Even so, she was never overcome by desperation for she found a substitute for life in books and she developed a great passion for poetry, which was to remain with her to the end of her life. As a teacher she met Armando Borghi and from then on she dedicated her life to anarchism. For her anarchism is not a dogma and neither is it a utopia. Or, to be specific, if there is an anarchist utopia, there is also an anarchist reality, and it is this anarchist reality that she is most concerned with communicating to us. A reality found in the aspirations of the human spirit, which is a constant struggle with the environment and convention for self determination and the realisation of freedom. She found it in the writings Homer, Aeschylus, in the mythological Prometheus who, as the son of Justice, lit the spark of thinking in man and put the great hope of liberation in his heart; and who, to assert himself, gave up the beatitude of divine life and rebelled against Jupiter. She found it in Euripides, Shakespeare, Cervantes, etc. a reality passing like a red thread through the works of many writers, painters, artists and litterati. This reality was part of her life in her struggle against authoritarianism, and particularly against Fascism. Even after her opposition to fascism had forced her to leave Italy, she was not defeated, but continued the struggle in Germany, Holland and France, where she lived from 1923 to 1928. Then she went to America where, in 1932, on the 11th of May, she died in New York, aged forty-three. Her literary output is slender; it consists of: "Tormento," a volume of poetry published in 1922 in Italy; "L’Ora di Marmaldo," a collection of prose published in France in 1928; and "Torce nella Notte," a collection of articles and treatises published in New York a few days before her death. There are also a lot of papers she gave, mainly in America, and a few unpublished articles, but as far as I know, none of her writings have been translated into English. This article is taken from the Italian anarchist paper, "Umanita Nova." This article I later found to be part of a paper given in New York on the 20th of March, 1932. On Edna St. Vincent Millay's "Justice Denied in Massachusettes"
Just a note on this, looks like there is a mistake, as it says she died on 11 May 1932, but this article was presented on 20 March, 1932. Another biography says she died 11 May 1933 (which works better chronologically), but Wikipedia says 12 May 1933. Anyone know for sure?